SupraSpace: On the Concept of Space and Place in Art and Visual Culture. Maybe because I’m a wanderer at heart and perpetual outsider, places fascinate me–what they look like, what’s gone into their making, how people live there–and I’m drawn to art and photography that visualizes places. When an academic conference came up this year about space and place in art and visual culture, I looked forward to presenting a paper I’ve been working on, and to bringing to the conference a Walker tour guide’s concern with viewer experience. My subject was an Indian artist who also focuses on personal experience. Atul Bhalla’s multidisciplinary works make visible an ordinarily ignored stretch of the river that flows past Delhi, foregrounding people’s relationships with water and the natural bodies it’s placed in. 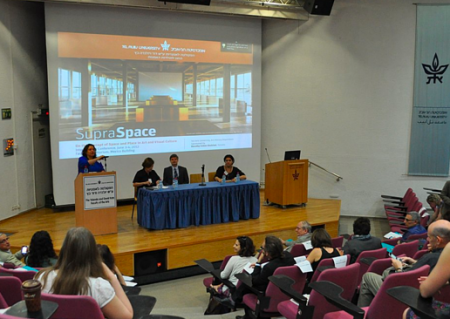 The SupraSpace conference took place June 3-4, 2012, at the University of Tel Aviv in Israel; after it finished, I planned to tour the West Bank, seeing for myself, I hoped, what these contentious places look like, how they’re experienced by the people who live there, and how they’re represented in visual culture and art. When I discovered, belatedly, that a cultural and academic boycott of Israel is on and gathering steam, the trip became problematic for me. Whether I attended or not, I’d be making a political statement about a conflict I know shockingly little about. In the end, I took inspiration from a collaboration my son mentioned, between Edward Said, the late postcolonial critic and advocate for the Palestinian cause and Israeli-Argentinian conductor Daniel Barenboim. Together and improbably they had founded an orchestra for Israeli and Arabic music students. I took both journeys, speaking in Israel about place consciousness, subjective experience, and an artist who models a relationship with a substance common to everyone. And then I traveled to the West Bank, trying to look as responsibly as an interested but inexpert outsider can–and trying to make my camera work. It’s taken me a while to put this series of blog posts together; they’re more like personal essays than the raw data of experience. Nor have I followed the threads of history back to the labyrinth where conflict began. These posts try to tell of what I saw in places I don’t belong to, but passed through as a fellow traveler on the planet. Next: City, Sea and Shared Spaces.